Please take a moment time, to understand those intelligent meters, because they are not like the usual meters. When measuring the Anode current of a tube, it is generally not desired that the signal path will go through the ampere meter. 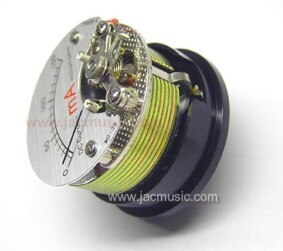 Reason is, that Ampere meter has a coil inside, and any Audio signals would be disturbed by this coil. 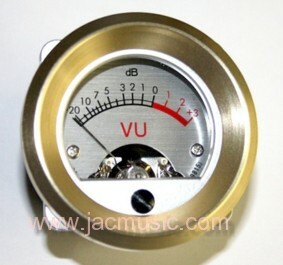 The intention of these meters is to prevent frequency dependent effects, and other kind of interference. Besides, precision of low cost devices is not very good. In series with the meter must be a resistor, to adapt for the value of the cathode resistor. This resistor is not be supplied with the meter, because the resistor value depends on the actual cathode resistor used. The resistor value is 100x the cathode resistor value, for the 100mA meter. 50x for the 50mA meter, 150x for the 150mA meter, and 300x for the 150mA meter. The meters are extremely precise, and are more an "instrument" rather than just a meter only. Another nice option is to use one meter, and just switch it from one channel to another, as done here with the flagship Yamamoto A06-02, the AD1 amplifier. 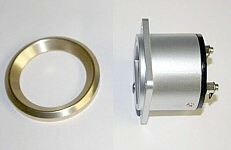 The meter is pictured here with the mounting flange, though it can be used also without also. No visible screws in the deck plate. The hole in the deck plate can be unprecise, as it will be covered fully. You can file it by hand, and the appearance is still professional. This is a meter to indicate any form of balancing. Full scale +/-300mV, DC resistance 6k Ohms. Another application is two tubes, with each having DC current up to 300mA. Then have an indication where the right tube makes the meter turn to the right, and the left tube makes the meter turn to the left.